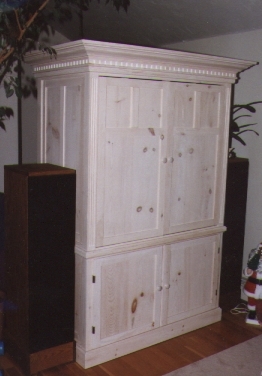 This is an entertainment center armoire in white-washed pine shown with the pocket doors closed (left) and opened & retracted (right). Here is just the lower section with doors open and drawers partly open. Flanking the unit are my 3-way tower speakers. 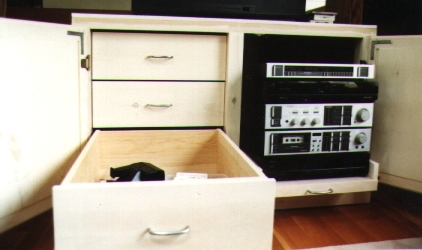 The lower half consists of three full-extension drawers on the left for media and a single heavy duty pull-out "tray" for audio equipment on the right. 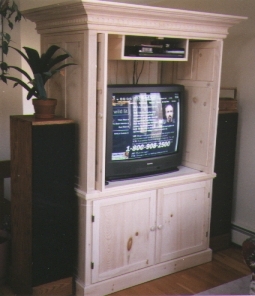 Due to its size, the top section is made of eight separate removable parts (two doors, two sides, a base shelf, the back, a top that also holds the VCR shelf, and the top moulding). The rear is fully finished with T/G pine - there are no knockouts. All moldings wrap around the entire unit. Panels on the top and bottom panels are continuous to retain their grain and appearance. 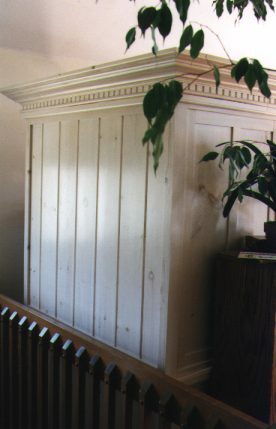 The finish is Behlen's White Pickling Stain and satin water-based polyurethane. Power and cables exit out the bottom via heat vents in the lower skirt.